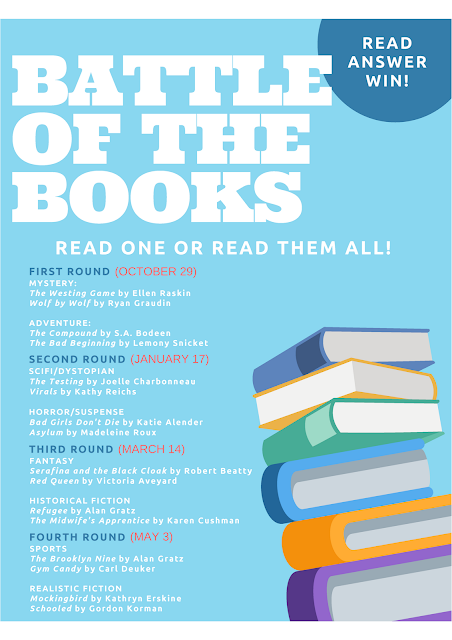 We will be competing in a Battle of the Books with two Dripping Springs middle schools. IT'S SO MUCH FUN! Fill out THIS FORM and select ONE book. You will receive your very own copy of the book and be invited to the Google Classroom for your round. You will be responsible for reading this book and being an expert on the book. You and the other students in the Round will compete together on the specified date for the round. You will be answering questions about the book.